There is a distinct excitement in the air as we make our way through the Von Lindequist Gate on the eastern side of Etosha National Park in Namibia. 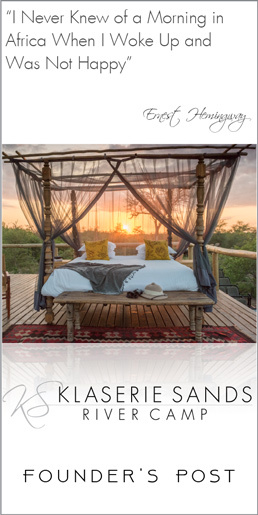 The sun has just risen, dappling the leaves of the mopane shrubs lining the road in mottled shades of gold and green. 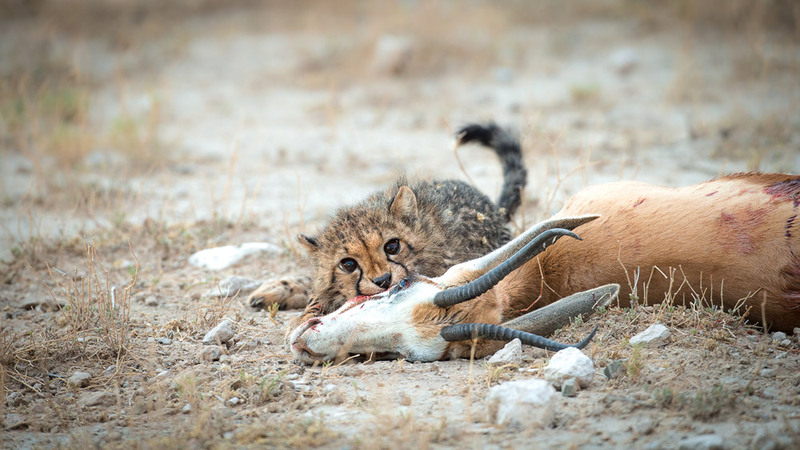 Barely a few minutes into the park and we are greeted with the astonishing sight of a large martial eagle sitting on the carcass of a Damara dik-dik, the second smallest antelope in Africa. 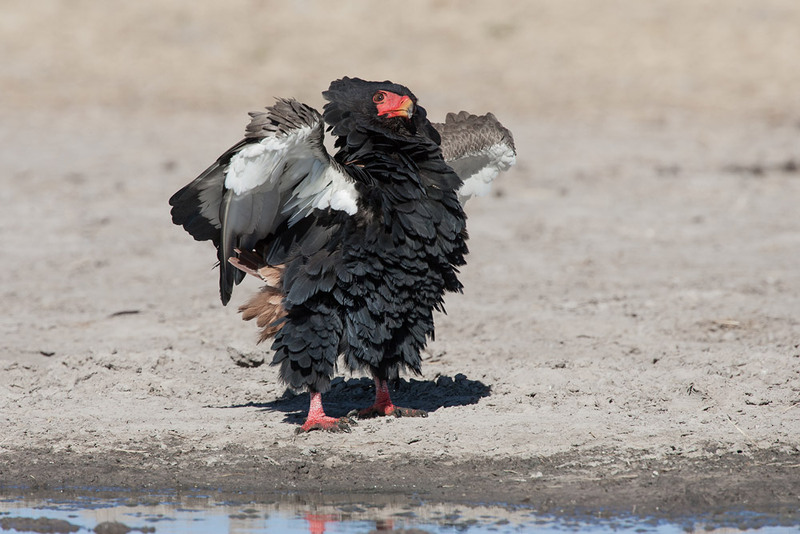 We are told by the guide that this particular eagle specialises in preying on the diminutive dik-diks. Our senses heightened by this bizarre encounter, we head to Klein Namutoni, the first waterhole on our journey. Luck is with us today; there is a pride of lions lying close to the water’s edge, claiming the waterhole for themselves and keeping everyone else at bay. 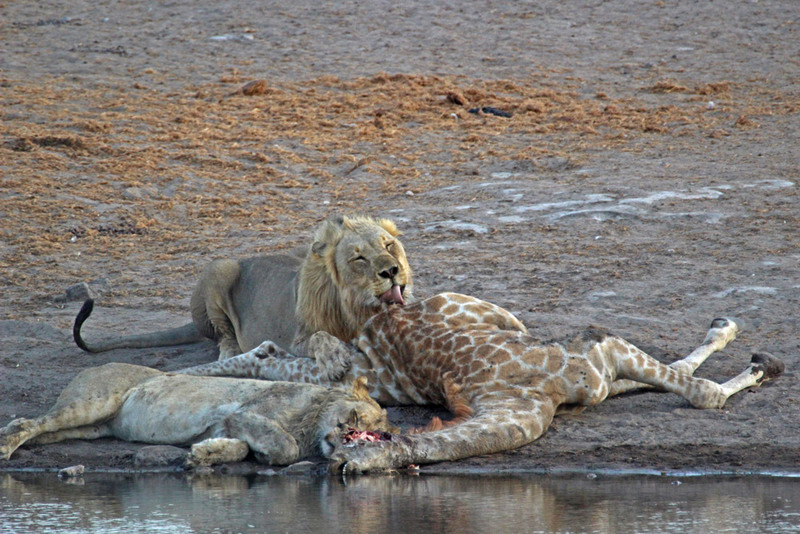 The male is draped over the remains of a wildebeest, chewing away on a leg and keeping a beady eye on two opportunistic black-backed jackals hovering in the background. A few giraffe are standing in the distance, casting a wary eye in the direction of the lions, while some impala and kudu cautiously mill about. We are in absolute awe of these beautiful, powerful predators and the eternal cycle of life and death so vividly depicted in front of us. Shutters are clicking away wildly and the lions are oblivious to the interest they are generating. 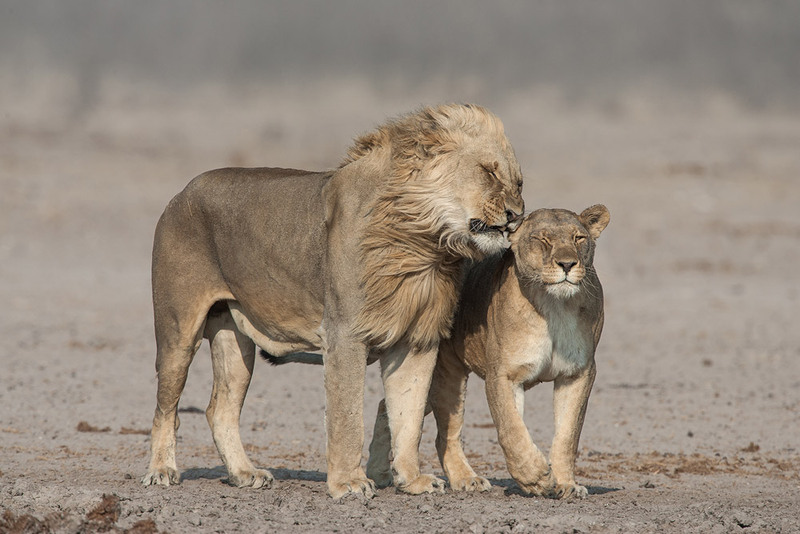 Etosha is a stronghold for lions, with an estimated population of 450 to 500; a major drawcard for tourists and certainly one of the many reasons I return again and again. The summer temperature is rising; it is late November and 40°C is on the cards for this time of year. It is advisable to bring plenty of sunscreen, a wide-brimmed hat, insect repellent and long, loose clothing to keep the heat and mosquitoes at bay. The winter months are considerably cooler though, but still reaching heights of 25 – 27°C during the day. 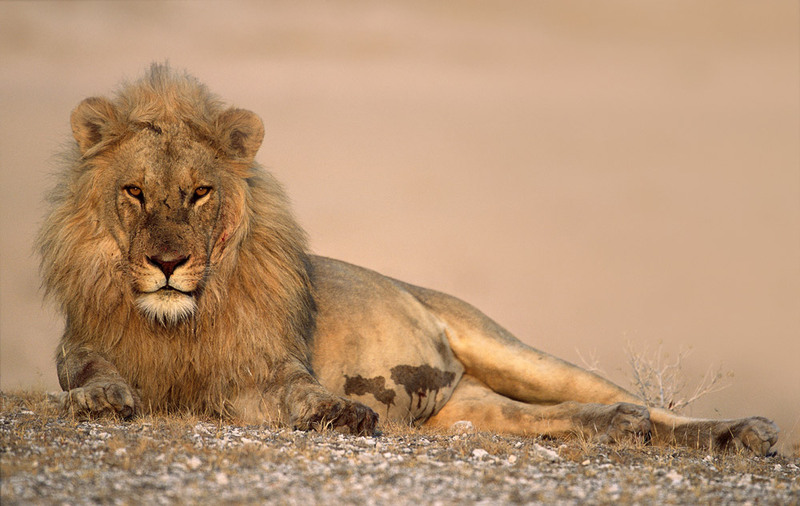 The lions stroll over to the shade of the nearest tree, leaving the carcass for the cleaning crew to finish off. Our driver guide is dispensing water bottles and cold drinks from a well-stocked cooler box, and suitably fortified we make our merry way to Chudob – one of my favourite waterholes in Etosha due to its size and the sheer abundance of animals that congregate there when water is scarce elsewhere. A number of people seem to have the same idea and we manage to jostle into position, the height of our open game drive vehicle a distinct advantage and guaranteeing us the best possible view of the waterhole. It’s mid-morning, and Chudob is teeming with wildlife. 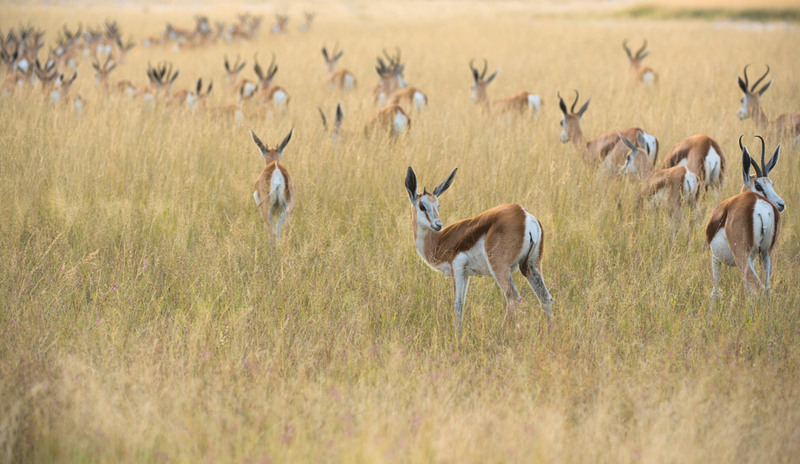 Herds of zebra are milling in the distance, with a motley crew of impala, springbok and kudu quenching their thirst at the water’s edge. Dense flocks of red-billed queleas are descending in a flurry of wings, jostling for space amongst double-banded sandgrouse and guineafowl. The cacophony of their wingbeats and chirping is deafening. An eland bull and oryx emerge from the dense mopane shrub and a warthog mom trots towards the water, with four piglets in tow. 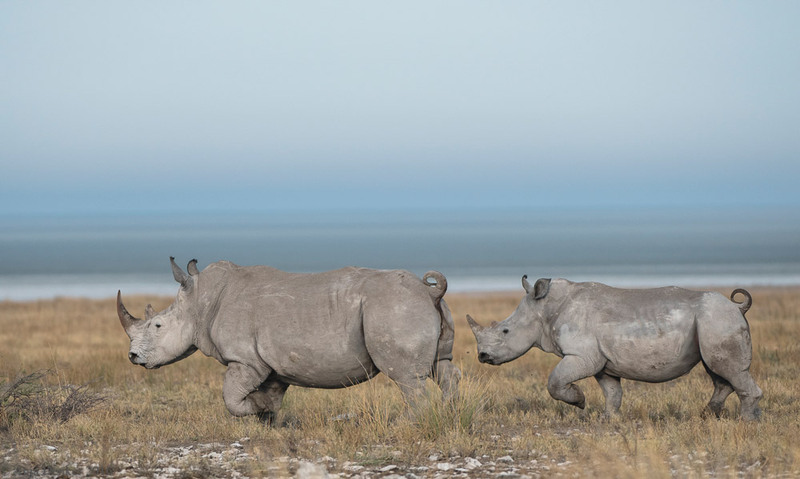 Suddenly there is a collective “Ahh” from everyone in the parking lot, as a black rhino emerges from the distant line of trees! 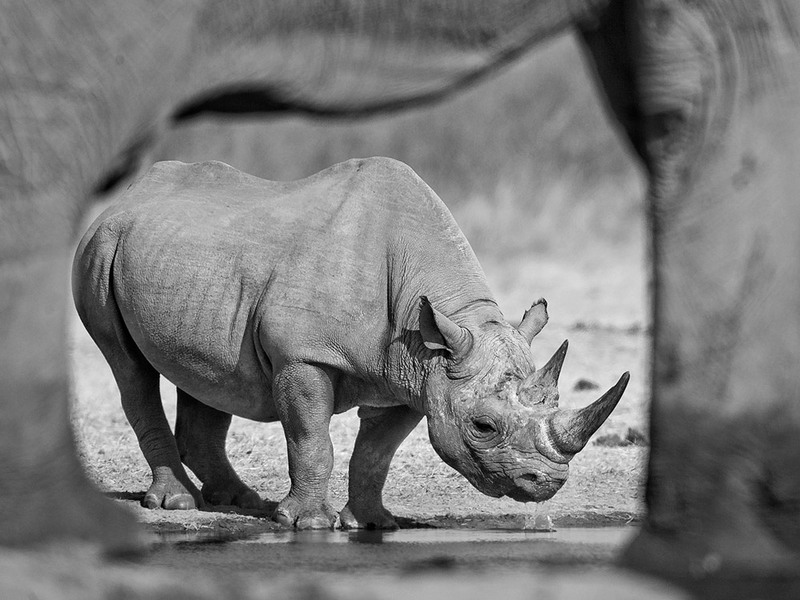 He breaks into a trot, making a beeline for the water, scattering the jittery antelope into a panicked stampede in the billowing white dust. Lunchtime beckons, and as we head back to the lodge we make a final detour via Fisher’s Pan, named after Lieutenant Adolf Fischer who was stationed at Namutoni during the 1880s. During the rainy season, which usually starts in December and can last until April, Fisher’s Pan is a haven for a number of wetland and migratory birds, especially flamingo. Now bereft of water, the pan is a vast flat white expanse in a shimmering haze. A lone elephant is the only sign of life on the pan, which is flanked by undulating fields of yellow grass. 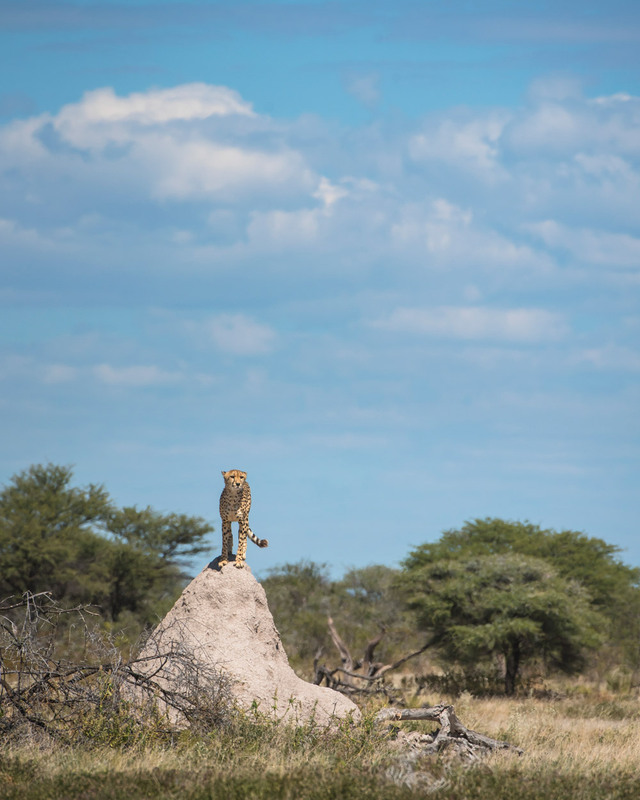 Cheetahs love to frequent the area and it was not more than a few weeks ago that I was privy to seeing one of them use one of the many termite mounds frequenting the landscape as a scouting point for possible prey opportunities. Back at the lodge, a dip in the sparkling blue pool refreshes body and mind, followed by a delicious light lunch and brief siesta in the tastefully decorated and air-conditioned room. Yes, life is indeed good. 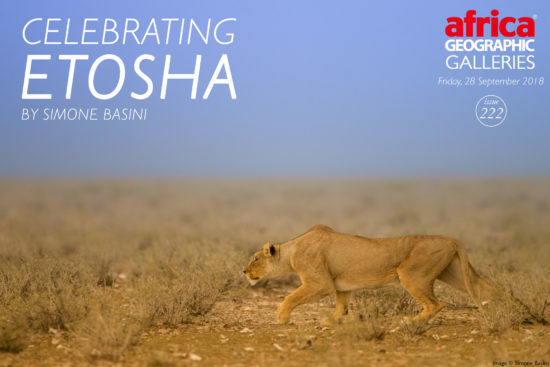 The afternoon game drive starts early and is scheduled to take us all the way to the various waterholes in the Halali region, one of the three main camps in Etosha. The Goas waterhole does not disappoint. 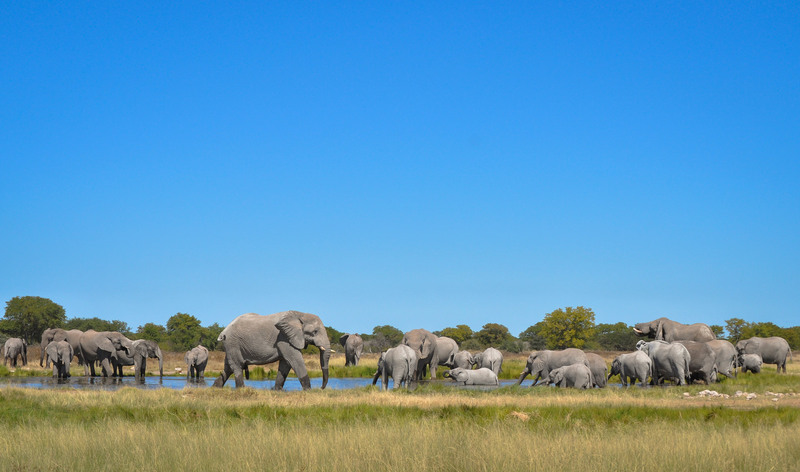 A breeding herd of elephants congregate around the wide, blue expanse of the waterhole. The youngsters are frolicking in the water and wallowing in the mud. A pair of mating lions are reclining in the shade of a huge purple-pod terminalia (Terminalia pruniodes) and a motley crew of spotted hyenas are fast asleep a little distance away; while a few scattered springbok remain vigilant. 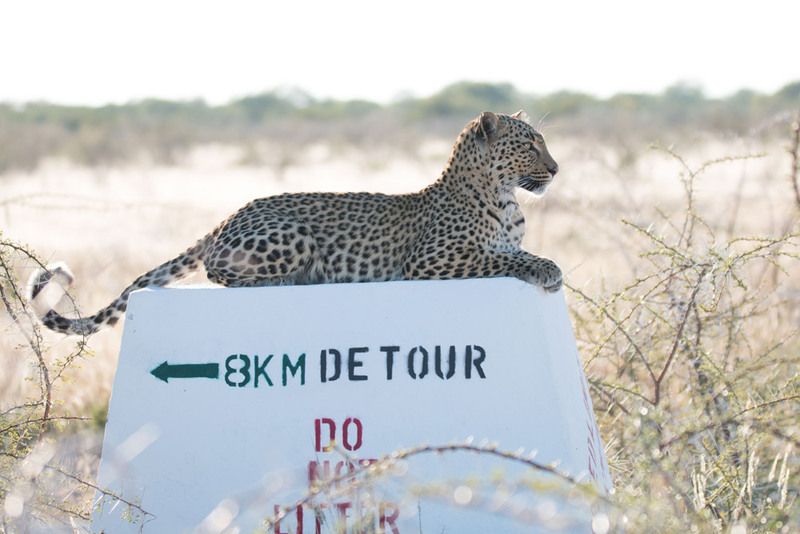 The access road winds around the two water sources, allowing for fantastic sightings of the animals drinking and moving to and from the water – game viewing at its best and one of the things which makes Etosha so very special. 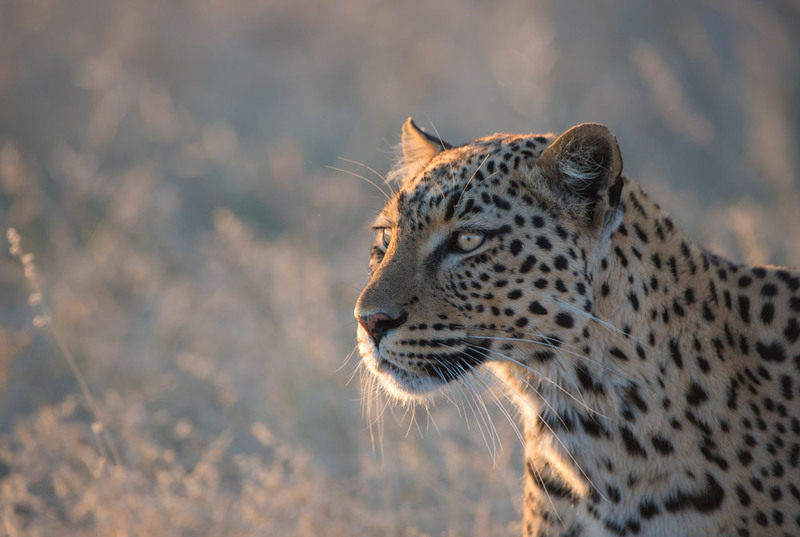 High hopes are set on tracking the resident female leopard at the Rietfontein waterhole, which she has been frequenting for quite some time now. 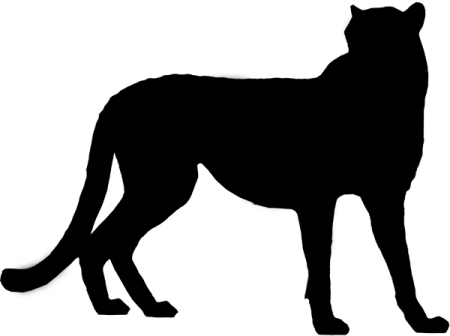 She is a formidable huntress and habituated around vehicles. We wait for a while, binoculars scanning the area. No luck this time and we move on. Salvadora offers a stunning vista of the pan stretching far into the distant horizon and derives its name from the evergreen mustard tree (Salvadora persica) found in the area. It is one of my favourite waterholes and as we gaze out over the wide expanse of the pan, I reflect back on the many unforgettable moments I have experienced here – from lions killing zebras to a cheetah chasing across the plains and those unforgettable sunsets as the red sun melts into the distant horizon. 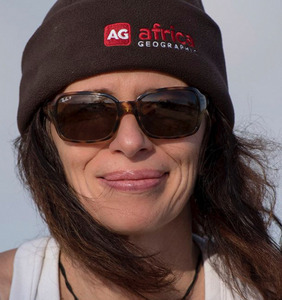 We have quite a distance to cover back to our lodge, and soon the night shift of aardwolf, bat-eared foxes, aardvark, and small-spotted genets will make their appearance. We have one last unexpected surprise in store for us. Driving past Rietfontein in the dying light, the Rietfontein female leopard makes an appearance, surveying her domain in the golden glow of the afternoon sun with no other vehicle in sight. It was breathtaking! We are stunned into silence and the atmosphere on our game drive vehicle as we leave is one of contentment and wonder, brought about by the shared experience of fabulous game viewing, unexpected surprises, breathtaking scenery of contrasts and colours, wide open spaces and the smells and sounds of the African bush. 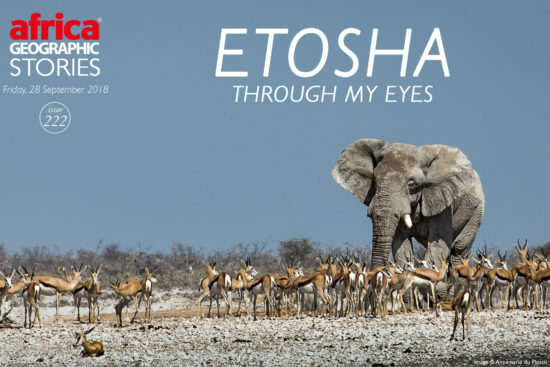 The essence of Etosha. 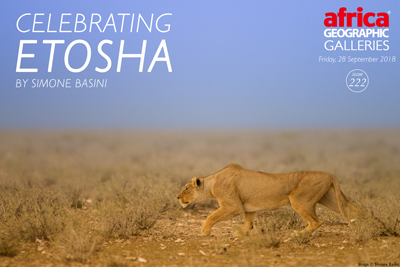 Etosha is the perfect year-round destination, with each season having its particular charm and beauty. I cannot think of a time in the park where I have not had special encounters. 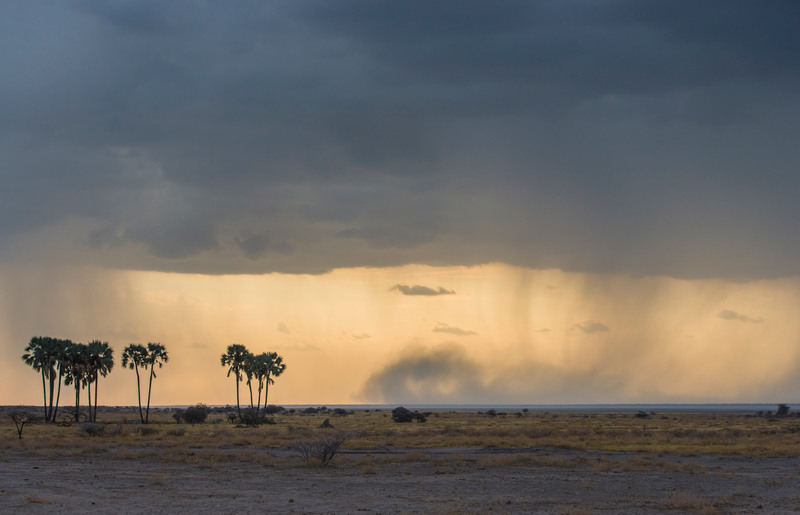 Etosha is a game-rich, arid savannah that is wrapped around an enormous salt pan, which floods to various degrees during the rainy season. The gravel roads are in good condition and easily navigable in sedan cars, making it the perfect location for a self-drive Namibia safari. Expect excellent sightings of lions, leopards, cheetahs and hyenas, and also expect to get very close to elephant, giraffe, zebra, rhino, springbok, black-faced impala, gemsbok and other species, while you relax at the waterholes waiting for the animals to come to drink during the dry winter season from May to October. Etosha has approximately 340 bird species, including the kori bustard – the world’s heaviest flying bird. 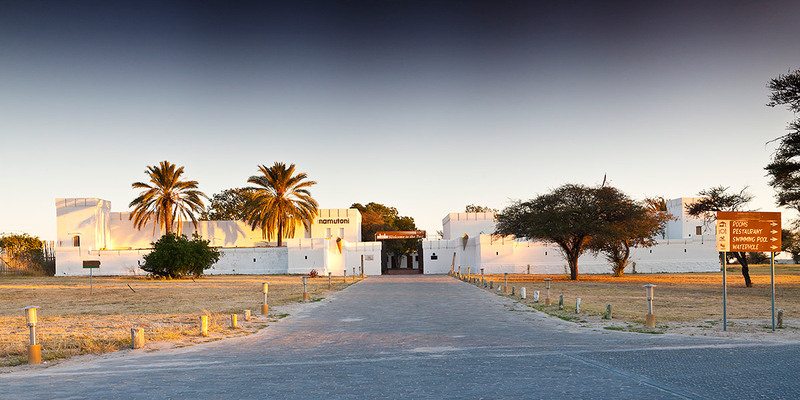 There is basic self-catering and camping accommodation inside the park, with very popular night-time floodlit waterholes, but we recommend staying in one of the private lodges based just outside the park – where you can go on night drives and bush walks, which are not permitted inside the park. Etosha is an easy drive on tar roads from Windhoek, but many choose to fly directly to the park when deciding to travel in Namibia. 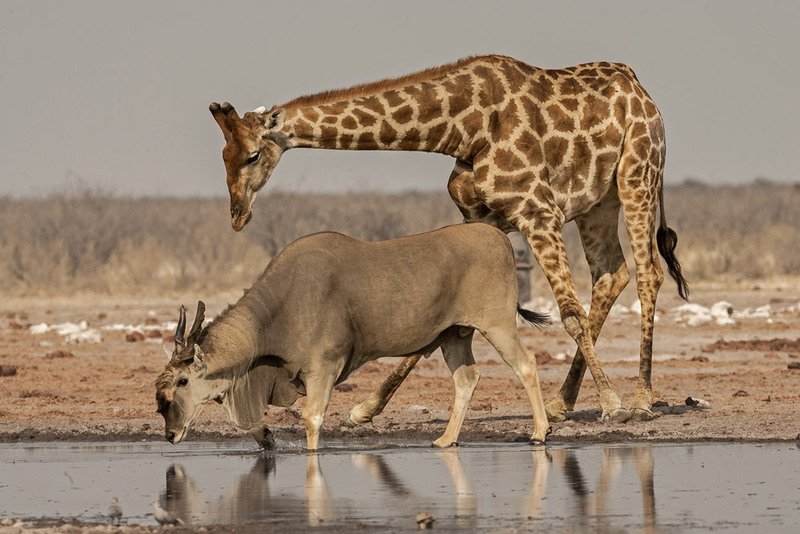 The best time to visit the park is during the dry winter season, when many of the animals are concentrated at waterholes and the grass is low, allowing for a better viewing experience. 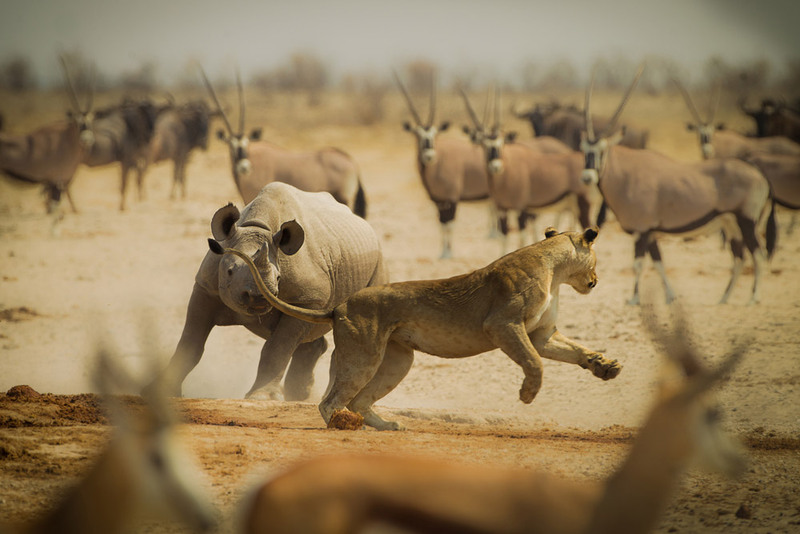 Winter: May to October is the dry season and provides the most action in Etosha as the wildlife congregates around the waterholes. This is the busiest season for visitors, who are attracted by the mild weather and better wildlife sightings. Summer: November to April is the rainy season, with the months of January and February generally enjoying the most rainfall. This is also when temperatures rise up to 40° Celsius, and visitors should take precautions against the strong sun. It is in these months that the usually dry salt pan of Etosha floods and is transformed into an exquisite birder’s haven with thousands of flamingos and migratory birds. 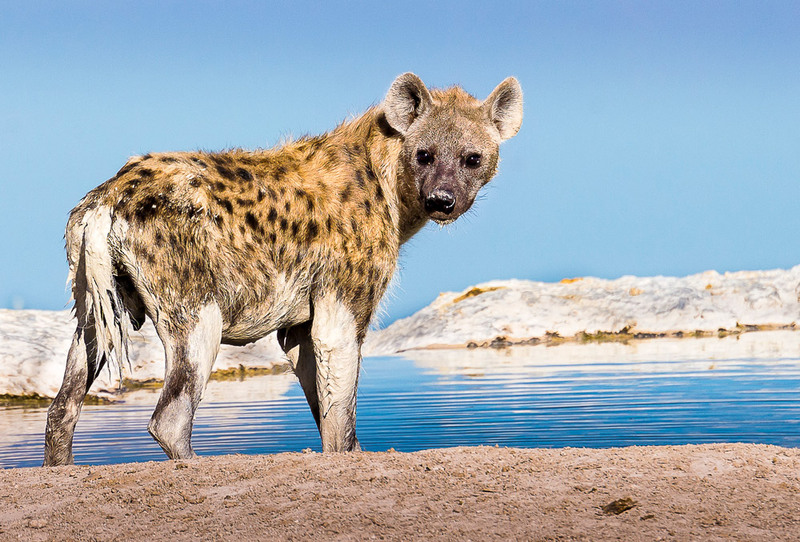 However, it is harder to guarantee game sightings during this period, as the widespread pools of water mean that animals have no need to visit the waterholes. Many of the bigger mammals such as elephants move towards the eastern side of the park at this time, especially the Namutoni area, as this area enjoys more rainfall than the western/Okaukeujo area. I follow the wild things… “When a person starts to talk about their dreams, it’s as if something bubbles up from within. Their eyes brighten, their face glows and you can feel the excitement in their words”. ~ John C. Maxwell. This quote pretty much sums up my passion for wildlife – especially lions – and nature. I have always followed a career in the arts, from fashion design to postage stamp design, before taking up wildlife photography – the camera firmly welded to my hands ever since! Living in Namibia, the country of my birth, I strive to convey emotion through my work, be it through photography, visual art or through words. 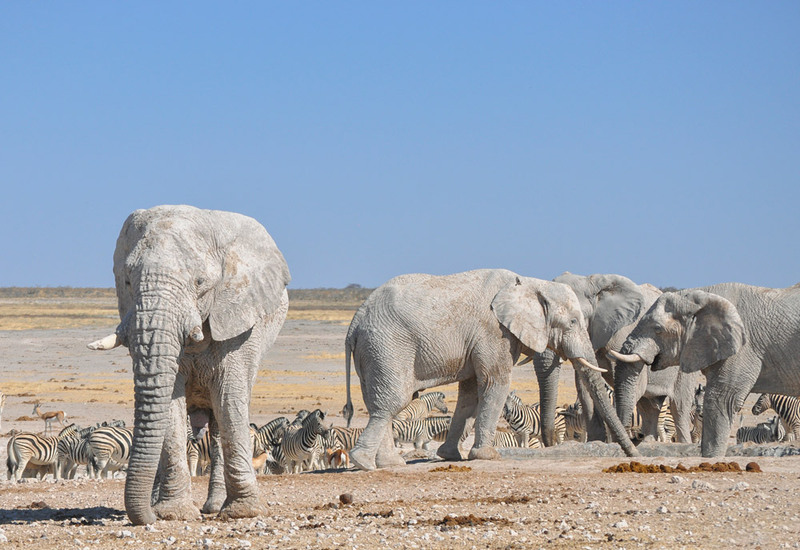 Etosha National Park in Namibia is the perfect year-round destination, with each season having its particular charm and beauty. 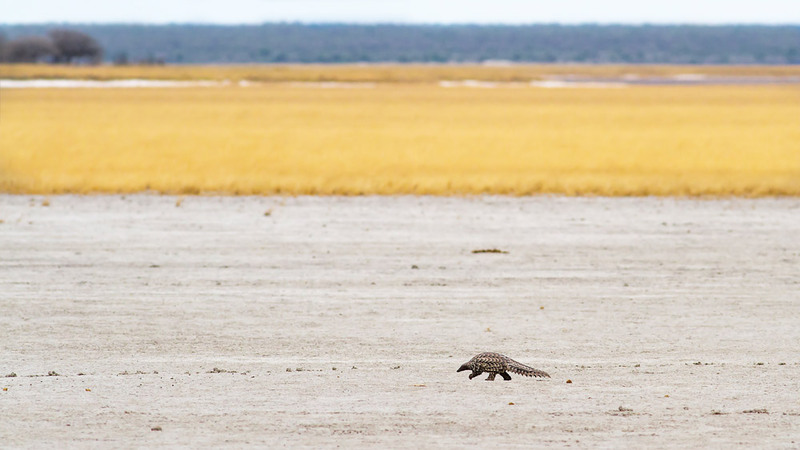 It is one of Africa’s top safari destinations and a photographer’s dream – probably one of the best places in Africa to photograph wildlife, whether you’re a beginner or an expert. 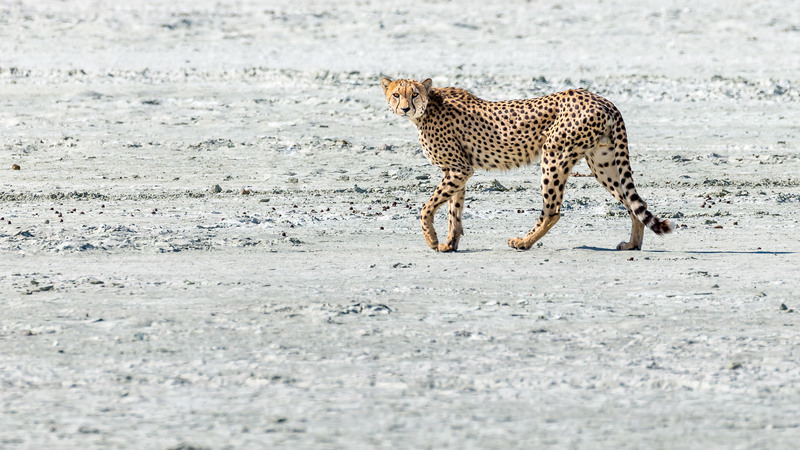 Elephants, zebras, black and white rhinos, lions, leopards, cheetahs, herds of springbok, giraffe, and wildebeest all call Etosha home in plentiful numbers. The landscapes are also spectacularly photogenic with wide, vast vistas, and barren salt pans under stunning blue skies. 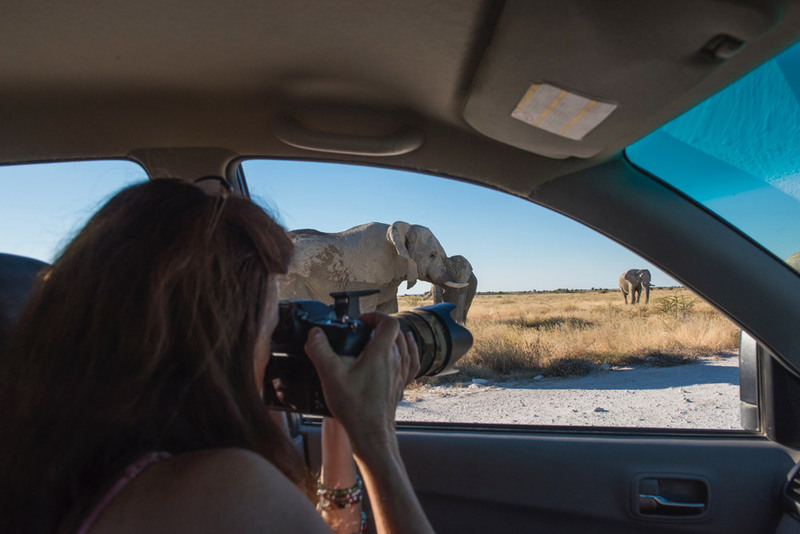 Etosha still on my bucket list. This great article and images confirm its status in my mind. Definitely a must Stephen – it sounds a bit trite but it truly is an iconic place, unique in every way….